Would you like a content management system that's actually easy to manage? We take a closer look at some user-friendly CMS solutions, including Pluck, SkyBlueCanvas, and NanoCMS. When you set up a website, you usually do so because you want to publish something, not because you want to spend time learning the intricacies of your content management system (CMS) or tinker with templates. In most cases, what you need is a CMS that is easy to install and maintain and allows you to create pages without spending hours reading documentation. If that's what you are looking for, you'll be pleased to learn that quite a few lightweight CMS solutions are available. If you need to set up a foolproof CMS that has virtually no learning curve, consider Pluck . Unlike many high-end CMSs, Pluck doesn't use a database back end, which makes installation, troubleshooting, and maintenance significantly easier. To install Pluck, download the latest release of the software and unpack the downloaded archive in the document root of your server. Set the permissions of the pluck directory to 777, then point your browser to http://yourserver/install.php. After you enter the required information, give your website a name, and add some text to the homepage, your website is ready to go. To tweak Pluck and populate it with pages and content, log in to the Administration area using the password you specified during installation. The Administration area is divided into three sections: Pages, Modules, and Options (see Figure 1). Figure 1: Pluck is ready to use in minutes. As you might have guessed, the Pages section is where you manage web pages and images. To create a new page, press the New page button. The WYSIWYG editor makes it easy to add and format text, insert images, and embed media files (Figure 2). The right column of the page-editing area contains a list of all uploaded images and existing pages, and you can insert an image or a link from the list in a page by clicking on Insert or insert link. The WYSIWYG editor provides all basic formatting tools, but if you find them a bit limiting, you can switch to HTML mode. If you want, for example, to embed a YouTube video or use markup not available in the visual mode, HTML mode can come in handy. Figure 2: The WYSIWYG editor makes it easy to edit pages in Pluck. Once the page is finished, save it by pressing the Save button and return to the Pages section. Here you can use the available buttons to reorder and delete the existing pages and edit each page's description and keyword. Although the latter step is optional, a good description and relevant keywords can make the page easier to find with the use of web search engines. The Modules section allows you to manage installed modules used to add new features to Pluck. The default Pluck installation comes with two modules: Contact Form and Albums. The Contact Form module is built into Pluck, and because you can't modify it, it doesn't appear in the Modules section. The Albums module allows you to create and manage photo albums that you can then publish on a web page (Figure 3). 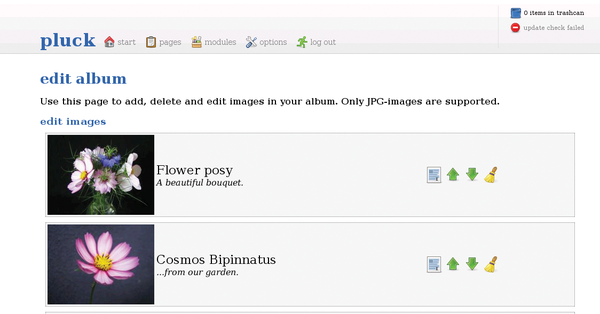 Figure 3: With the Albums module, you can publish photo albums with Pluck. Creating a new photo album is rather straightforward. In the New album field, give your album a name and press Save. Then use the New image form to upload photos to the album. To publish the newly created album, create a new web page (or open the existing one) and scroll down to the Modules section. To specify the order in which the added modules appear on the page, select 1 or 2 from the Albums drop-down list and press Save. In a similar manner, you can add a contact form to a web page. The Options section allows you to modify general settings, such as the site's title and your email address. Here, you can also change your password, manage modules, and change the default theme. Pluck does have some limitations: You can only insert albums and contact forms at the bottom of a web page, and the system doesn't provide an easy way to embed videos from YouTube or other similar services. Although Pluck is not the most flexible CMS around, it really excels when it comes to ease-of-use. If you want to set up a website for your family and you don't want to spend hours on the phone explaining simple things such as how to create a page or insert a photo, then Pluck is a good pick. Like Pluck, SkyBlueCanvas  doesn't rely on a database back end, and installing this CMS is ridiculously easy. To do so, first download the latest release and unpack the downloaded archive in the document root of your server. Then change the file permissions of the /skyblue/data/ directory to 755 and point your browser to the server's address. The installation consists of just a single step in which you specify a username and a password. After that, log in with the newly created credentials to go directly to the administration area that consists of five sections: Pages, Pictures, Collections, Templates, and Settings (see Figure 4). 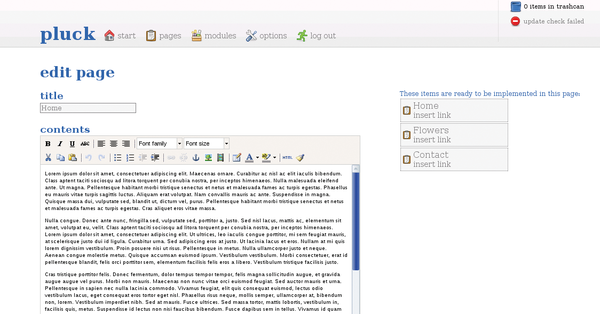 As in Pluck, the Pages section is where you add and manage web pages. However, if you press the Add button to create a new page or Edit to modify the existing one, you'll immediately notice that SkyBlueCanvas offers more editing tools than Pluck (Figure 5). 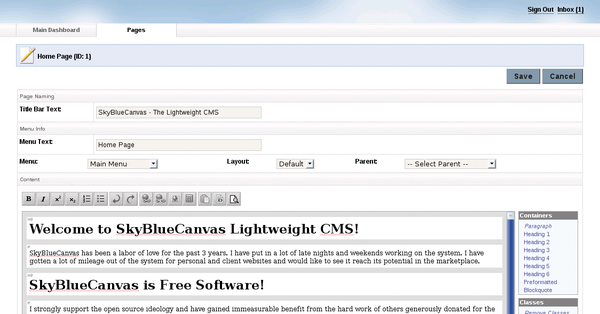 Figure 5: Besides a WYSIWYG editor, SkyBlueCanvas features containers and classes. 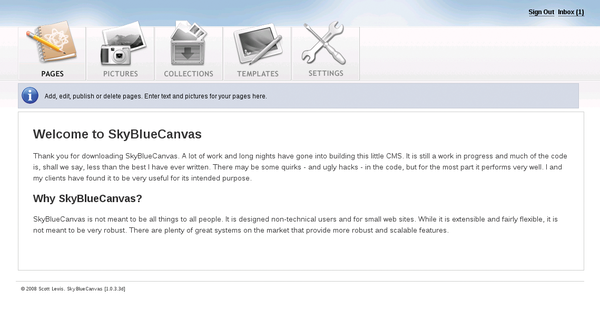 In addition to a WYSIWYG editor, SkyBlueCanvas features so-called containers and classes. Containers allow you to apply text formatting to the selected paragraph, such as Heading 1, Preformatted, and Blockquote. The classes let you apply specific layout settings to the selected paragraph. For example, applying the Note (hidden) class to a paragraph hides it from the page, whereas theImportant class turns the paragraph into boxed text. The Published drop-down list lets you choose whether to publish the page. The Pictures section is designed to add and manage graphics files used in web pages. When you press the Insert image button in the editor's main toolbar, the system displays a thumbnail gallery of all graphics files in the Pictures section. Simply click on the picture you want to insert into the page. The Collections section is the most interesting but also the most complicated feature of SkyBlueCanvas. Say you want to use SkyBlueCanvas to publish a series of articles. To do this, create a new page in the Pages section, then type "Articles" in the Title Bar Text and Menu text fields, and choose Main Menu from the Menu drop-down list. After setting the Published option to Yes, press Save to save the page. Now take a look at your website and notice the Articles entry in the main menu. If you click on it, you will see a blank page with no menus or content. Because SkyBlueCanvas treats each page as a placeholder, you must manually populate it with content. The content in SkyBlueCanvas is managed as collections, which can be anything from links and contacts to photo galleries and articles. For starters, you might want to add the main menu to the Articles page. To do so, press the Collection Publishing button in the Collection section and click on the Edit link next to the Main Menu entry (Figure 6). 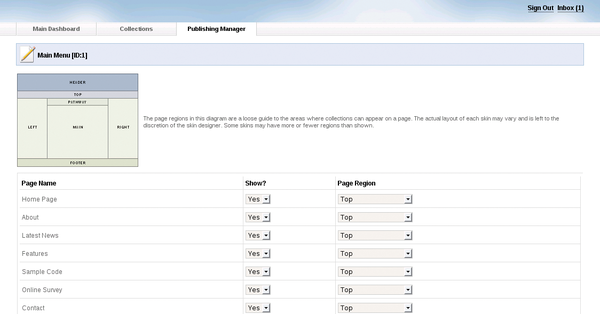 Figure 6: Container Publisher allows you to manage collections. After you locate the Articles page, choose Yes and Top from the Show and Page Region drop-down lists, respectively. Now if you press Save and refresh the Articles page in your browser, you should see the main menu on the page.In a similar manner, you can add links to the right column. In the Collection Publishing section, click on the Edit link next to the mod.links.php entry and choose Right from the Page Region drop-down list. Among other items, the Collections section contains the Articles collection, which allows you to create pages using the supplied article template and organize the articles using groups. Next, press the Articles button in the Collection section and add new article pages and groups. After you've done that, go back to the Collection Publishing section, click on the Edit link next to the mod.articles.php entry, and choose Main from the Page Region drop-down list. After you refresh the Articles page, you should see an expandable and clickable list of articles in the body of the page. Although this is not the most straightforward way of creating a web page, it does offer you a lot of flexibility in how you present the content of your website. As the name suggests, the Templates section is used to install new templates and tweak the existing ones. Finally, the Settings section allows you to modify basic settings, such as website title, URL, general info, and so forth. SkyBlueCanvas provides more flexibility than Pluck, but this power comes at a price – understanding how to manage content and construct pages with the use of collections requires time and effort. However, if you are willing to go through the learning process, you can use SkyBlueCanvas to manage small and medium-sized websites like a pro. 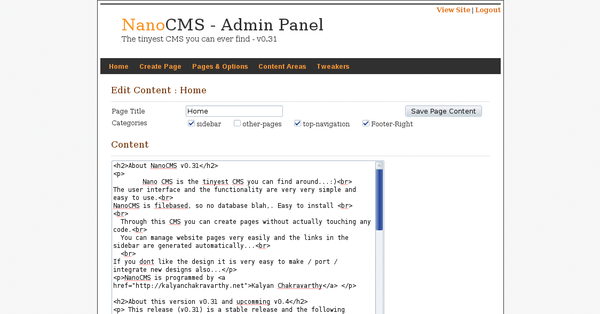 NanoCMS  is billed as the tiniest CMS you can ever find, and this is not far from the truth. When unpacked, the entire system is only 70KB in size. Also, it is one of the easiest systems to install and configure. First, download the latest version of the software and unpack the downloaded archive. In the resulting directory, locate the data/config.php file and open it in a text editor, then change the default username and password, save the file, and upload the contents of the folder to your server's document root. After you change the permissions for the data/pages and date/areas directories to 777, NanoCMS is ready to go. In your browser, navigate to http://yourserver/data/nanoadmin.php and log in to the administration area using the specified username and password. The administration area is divided into four sections: Create Page, Pages & Options, Content Areas, and Tweakers (Figure 7). Creating pages in NanoCMS is as easy as it gets. Just go to the Create Page section, give the page a name, enter text in the Content field, and add the page to the menu you want; you can add pages to the sidebar, the top menu, and the footer menu. Figure 7: NanoCMS is a tiny, no-frills system. NanoCMS doesn't have a WYSIWYG editor, so all formatting is done with raw HTML code. When the page is ready, press the Add Page button to publish the page. The Pages & Options section allows you to manage the existing pages: you can re-order them, move to a different section, and delete them. To modify your website's general settings, click on Content Areas. NanoCMS's default functionality can be expanded with the use of so-called tweakers. For example, you can add a WYSIWYG editor to NanoCMS by adding the OpenWYSIWYG tweaker (Figure 8). To install a tweaker, copy the content of the tweaker's archive in the data/tweaks directory of your NanoCMS installation. In the administration area, navigate to the Tweakers section and press the Activate link next to the OpenWYSIWYG editor item. Now you can edit pages without getting your hands dirty with HTML coding. Figure 8: NanoCMS can be expanded by tweakers. As you would expect from such a tiny system, NanoCMS's functionality is pretty bare-bones, but the system still offers all the essential tools for managing a small website. Although you probably wouldn't want to use NanoCMS for managing a site with more than 15 to 20 pages, if you need a no-frills solution that can be deployed in a matter of minutes, NanoCMS might be just what you are looking for. With the help of the applications we describe, Raspberry Pi can perform a wide range of server duties.